Ryan Hayes has left Dartford FC to sign for National League South rivals Concord Rangers on a two-year deal. He spent 13 seasons with The Darts, scoring 108 goals in 580 appearances. 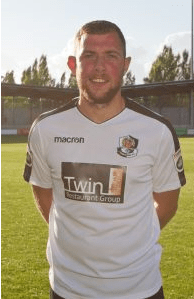 “Since the day I walked in to the DFC family it’s been an absolute pleasure to put on a Dartford shirt. I loved every minute of it! It’s the right time for me personally to move on. It’s the hardest decision I’ve ever had to make in football. I’ve met some of the greatest people you could hope to meet. I’ll miss the core (Elliot Bradbrook, Danny Harris and Lee Noble) like you wouldn’t believe. I’ll miss Princes Park, I’ll miss everything about being at Dartford FC. There is always lovers and haters anywhere you go but I always gave my all in a Dartford shirt. The three promotions were a massive high and I’ll never forget my time at Dartford. This news broke in the same hour that Dartford announced their new management team for next Season in Jamie Coyle and Flanagan.